Institute manager Kevin Deery is hoping to add a striker before the transfer window shuts. Deery has to move quickly after he confirmed that Garbhán Friel has decided to leave the club. “To be honest Garbhán has been struggling with it for the last number of weeks,” he said. “Football isn’t his first love, it’s boxing and I think he’s sort of fallen out of love with the game. “The rewards of coming up and down from Buncrana two or three nights a week aren’t there, so he’s made his decision that he can’t motivate himself to commit to all the travelling for training and games, so he has parted company with us, which is unfortunate. “I felt Garbhán did well for us and we wish him well, but we have to move on and because of that we are trying to fill the void by getting a striker in before the window closes. “But in saying that we have had young Alex Pomeroy in training with us and he looks like a player which we don’t have. This weekend the Drumahoe men travel to second from bottom side Lisburn Distillery, who they watched last week lost heavily at home to Loughgall. “Kevin (Doherty) went down and did a report on Distillery and we have a bit of video of them,” added Deery. 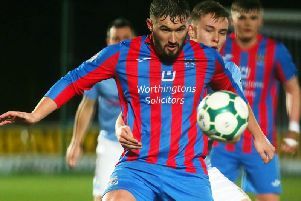 “We have to go into the game with confidences because our last two league games we have picked up four points against Ards and Bangor, we probably deserved maximum points from those games, but we have to realise that we are in a good run at the minute. “Yes we lost to Sport and Leisure but outside of that Irish Cup defeat we are in a good wee run at the minute. “We have had meetings, spoke about where we want to go and what we need to do in the league and have set a couple of targets. “After the Queen’s win we quickly switched our intentions to the task in hand against Distillery. Stute’s recent signing Niall Grace is likely to be added to the squad, while Graham Crown should return after sitting out last weekend’s trip to Queen’s, but duo Aidan McCauley and Ciaron Harkin miss out through suspension. “Graham has played a lot, as did a number of the boys who were on the bench last Saturday, so we had to freshen things up, but everyone should be available this weekend,” he added.